I love hearing from our house cleaning clients that we have met or exceeded a clients house cleaning needs. This review was sent to us from a very happy Judy in Sarasota, FL. 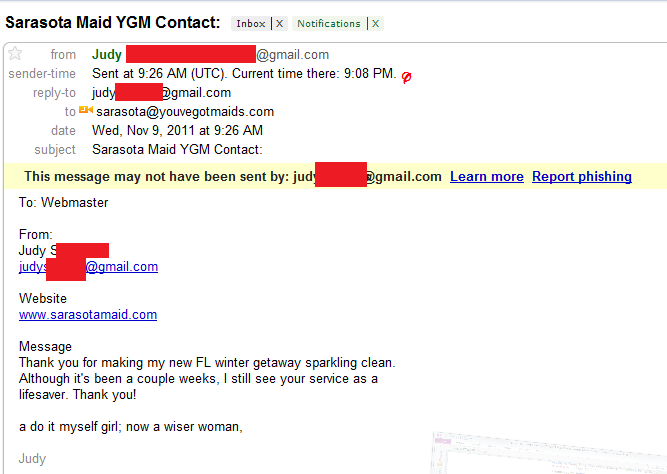 Judy must be what we lovingly refer to as Snowbirds, who return to their beautiful Sarasota homes each fall. This year Judy returned to a perfectly clean Sarasota home courtesy of Marion Denby's You've Got MAIDS office serving all of Sarasota County. To learn more about our Sarasota House cleaning company by dialing 947-979-8462.